And so begins the most wonderful time of the year. It’s December, which means I’m now obsessively prepping for the holidays, getting my winter bod ready, running around like a maniac to finish all my holiday shopping, bouncing from one party to the next event, and frantically trying to bake every single thing on the dessert list that I have started in January. On top of that, Matt and I are wedding planning, finalizing our upcoming trip for next month, and oh did I mention I’m also starting a new job? Things are busy and dizzying and oh-so-exciting and I wouldn’t have it any other way. I have a perennial grin on my face and why yes, I do bring up our engagement and show off my ring every chance I get, but I hope you would forgive me and join me in basking in this happiness. 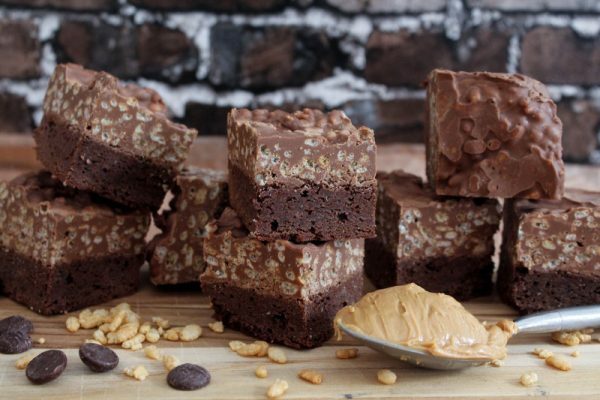 And today I bring you Peanut Butter Crunch Brownies. 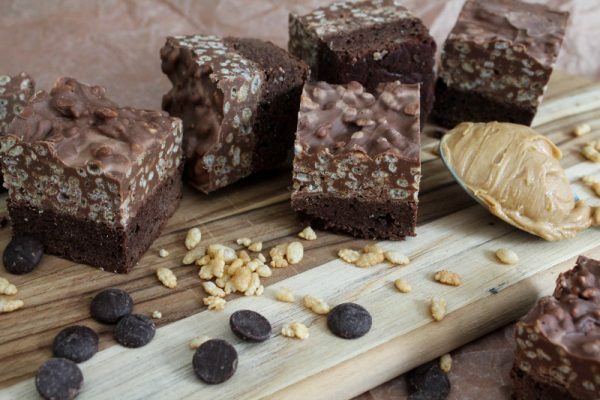 I am ashamed to admit that in all these years of writing this blog and publishing brownie recipes since 2010, I have not yet featured a brownie that combines the tasty pairing of chocolate and peanut butter. I’ve created and tested and succeeded and failed at so many recipes here, that I’ve lost track of the fact that I still haven’t made one of the most well-loved brownie flavors of all time. So I knew I needed to make this one a good one, to make up for all those years. And I promise you, this is perfect. Perfect if you like a good fudgy brownie base. Perfect if you like smooth and creamy peanut butter. Perfect if you like a little crunch (no, make that a lot of CRUNCH!) because the peanut butter topping is bursting with rice crispies. And so so perfect if you’re the type who wants your brownie topping to be as tall as the actual brownie base itself. A little salt, a little vanilla, a lot of chocolate, and we have magic. 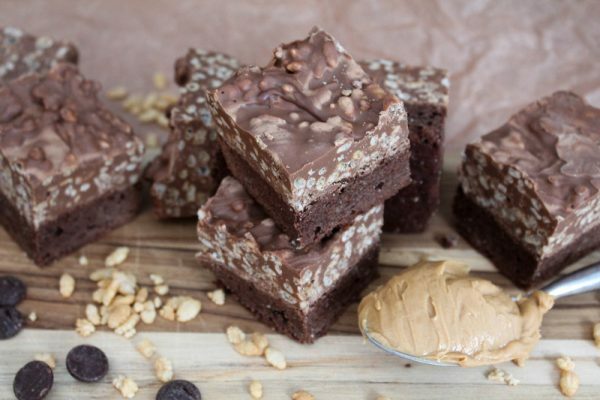 I love these brownies because it has the classic combo of chocolate and peanut butter, plus that unexpected texture from the rice crispies. I used brown rice crispies because that’s what I had, and I used milk chocolate because I like it better than dark. I could’ve spruced it up with a sprinkling of smoked sea salt but I decided to stay true to the classic flavors. 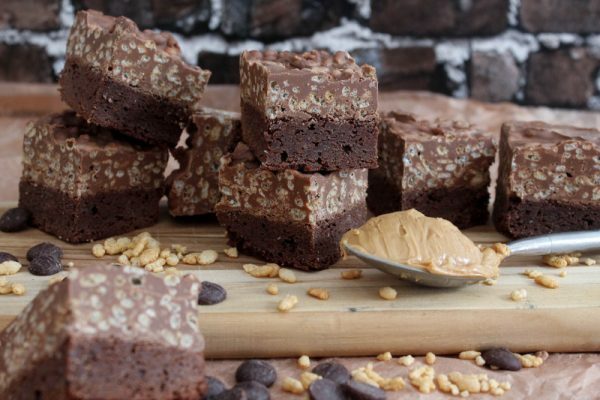 You’ll have to open your mouth wide to take a bite of one of these brownies, but you’re sure to end up with a big chocolate peanut butter grin. Bake 30 minutes, or until toothpick inserted in brownie comes out clean. Make the peanut butter topping. In a medium microwave-safe bowl, combine peanut butter and dark chocolate chips. Heat for 1 minute, stir, and heat again in 30-second intervals, stirring in between, until smooth. I ended up heating everything for a total of two minutes. Add vanilla and salt, and fold in brown rice crisps. Mix well. 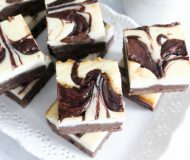 Make these brownies soon and give them away for the holidays! Actually make two batches, one to give away and one to keep in your fridge for snack time and dessert emergencies. Oh boy, these look so amazing! I am so craving that crunchy top and you can’t go wrong with brownies and when you have a dessert like this, it just beats all! And so much happy/exciting news going on at your end. Congrats and enjoy every minute of it! oh, i just love layered treats! 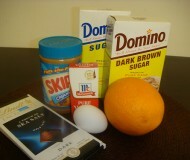 plus, peanut butter and chocolate make of the best combinations of all time, arguably the very best. these are great! 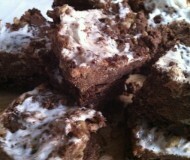 I love all the different textures and DELISH choc/pb flavor in these brownies!!! OMG. You have created my dream brownie. I love the pb, but especially the CRUNCH aspect. They look like they have the perfect combo of texture and flavor. These look really good Bianca. I love the addition of rice krispies… it’s very unique. Haven’t seen these before. Wish you a Merry Christmas and a Happy New Year!